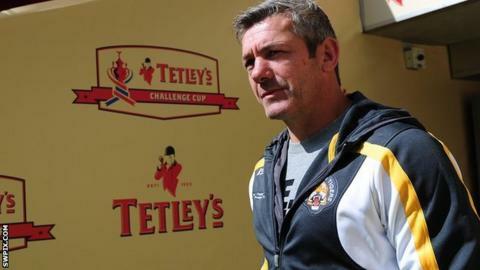 Castleford Tigers coach Daryl Powell is considering whether to appeal against the £500 fine he has been given by the Rugby Football League. Powell has been found guilty of misconduct for his public criticism of referee James Child after his side's 41-0 play-off defeat by St Helens. The former Featherstone coach called Child's performance "horrendous". "I stand by my comments. There has got to be accountability for everything that goes on," he told BBC Radio Leeds. "I'm going to decide whether I appeal or pay the fine. "Something has got to change there. Players and coaches are accountable for their performances so I think referees should be as well." Half of his fine is suspended until the end of next season. Meanwhile, Powell confirmed that the club will not be offering a new deal to veteran prop Garreth Carvell. The former Warrington man, who is out with a neck injury, joined the Tigers from Hull FC in July after a successful loan spell and made five appearances. "We've signed a pretty big pack for next season and it was the right decision for us," said Powell. "I wish Gaz all the best whether it's playing or in the game in some other capacity."